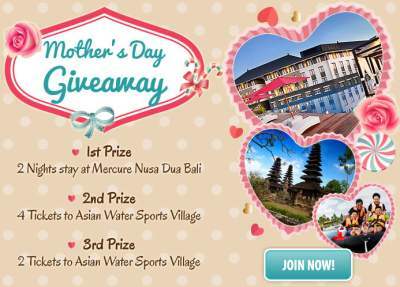 Home » travel contest » Cuti.my Mother's Day Giveaway: Win a Stay at Mercure Nusa Dua Bali! Cuti.my Mother's Day Giveaway: Win a Stay at Mercure Nusa Dua Bali! Click like button on CUTI.MY facebook pages (be a Cuti.my fan). Share this contest with your friends. Visit Cuti.my Mother's Day Giveaway for more details.